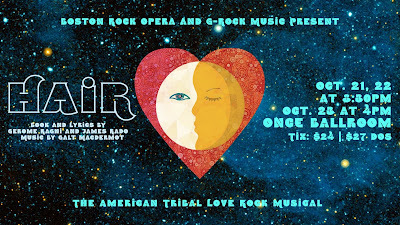 Coming to the Once Ballroom in Somerville in October is the rock musical Hair. 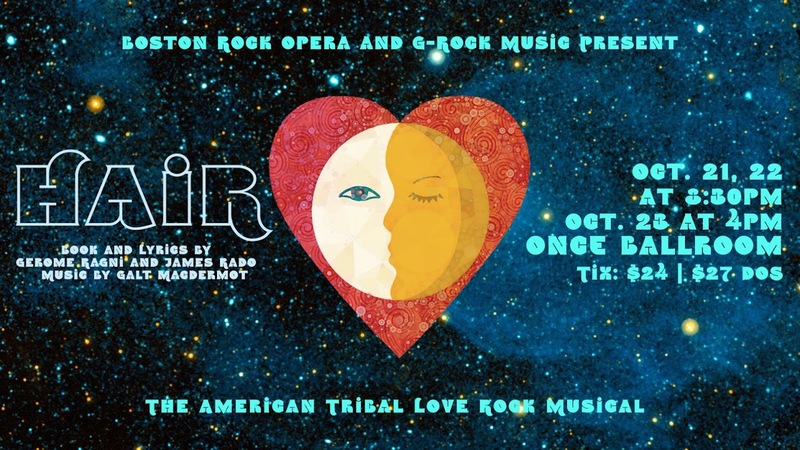 Coming off the recent two-night sold-out show success of “Stardust to Blackstar: The Lives of David Bowie” at ONCE Somerville, Boston Rock Opera didn’t skip a beat and immediately began production on their new staging of the 1968 seminal rock musical, HAiR. Book and Lyrics by Gerome Ragni and James Rado; Music by Galt McDermott. This BRO production also takes place at ONCE Somerville, Friday through Sunday, October 21, 22, and 23. The Ballroom becomes the New York City home and loft space of the tribe of artists, performers, believers and misfits who find each other during the tumultuous social climate of the late ‘60s. The audience becomes the lens for their stories as they prepare for a Be-In protest against the draft and the Vietnam War. Under the direction of original BRO founder, Eleanor Ramsay and the musical direction of Clinton Degan (Body English), the tribe and audience will be taken on a trip through time and space through the eyes of its main character, Berger, played by Rodrigo Von Stoli (Aquanutz). Joshua Rajman plays the tragic Claude Bukowski and Kat Bondi (Alchemilla) is the yippie protester Sheila. Produced by Erica Mantone and G-Rock Music’s Kameelah Benjamin-Fuller, the HAiR cast and band features a diverse mix of 30 Boston area musicians, dancers and actors including Jen D’Angora (Jenny Dee and The Delinquents), Destiny Claymore, Zachary Rochester, Sandra Marcelino, Andy LeBlanc, Jude Torres, C. Moon Mullins, Catherine Capozzi, Pete Sutton, Kyle Harris and Matthew DiMuccio. HAiR takes place October 21, 22, 23 at ONCE Somerville, 156 Highland Ave. Somerville, MA. (www.oncesomerville.com) Showtimes are at 8:30 p.m. (doors open at 7:30) on Friday and Saturday and 4:00 p.m. (doors at 3:00) on Sunday. Tickets can be purchased for $24 in advance at Ticketfly.com (links to follow). Tickets will be available for $27 day of show.